Daily Mirror - Is India the Key Beneficiary of the India-Sri Lanka Free Trade Agreement? Is India the Key Beneficiary of the India-Sri Lanka Free Trade Agreement? In the current debate on India-Sri Lanka trade, it is often said that the trade deficit between India and Sri Lanka has widened over the years in India’s favour and thus India is the major beneficiary of the India-Sri Lanka FTA which came in to operation in 2000. It is true that the trade deficit between the two countries has increased over the years but does that really mean that India was the major beneficiary of the FTA? Let us look at this issue from a general perspective before going into specific issues. Today, we are living in a globalized world and trading with many nations. A small country like Sri Lanka mainly depending on external trade, with a limited production base is bound to have a trade surplus with some countries and trade deficit with others. 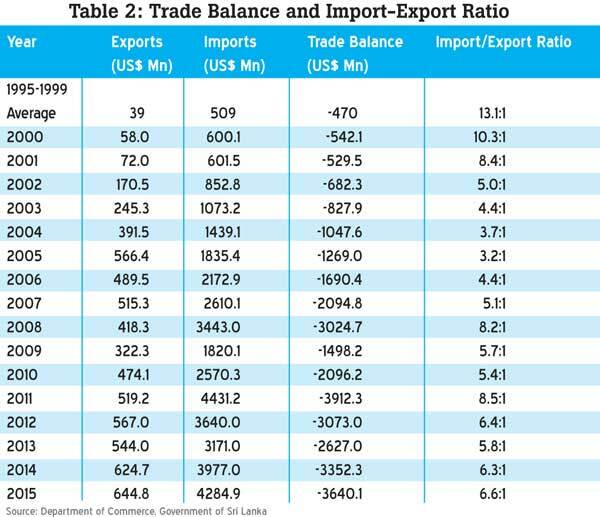 Accordingly, Sri Lanka has trade surpluses with US and EU and trade deficits with India, China, Japan, Singapore, UAE, etc. In other words, some countries are major export destinations and not sources for major imports and some others are major import sources and not major destinations for exports. Thus a small trading nation in a globalized world cannot have surpluses with all its trading partners; with some trading partners there will be a surplus and with some other trading partners there will be a deficit. This global reality should be understood first. Second, the objective of an FTA is not to bring a balance in the trade deficit but to work out a ‘win-win’ situation to both producers and consumers in both countries. In doing so, there can be instances when the trade deficit increases for one partner. For instance, the inflow of necessary consumer goods, machinery and spare parts for the industry and intermediate goods like textiles and oil, to one trading partner can be huge while the supply capacity of the same trading nation may be limited and cannot immediately increase to expand its exports to match the import flow. If one looks at the composition of imports from India to Sri Lanka, the bulk of it comes mainly to fulfil consumer needs like vehicles, pharmaceuticals, sugar, etc. Some other imports are intermediate imports for the industry like textiles, vehicle parts, and oil. For example, Sri Lanka annually imports close to US$60 mn worth of Yarn and US$300 mn of Fabric from India which are needed inputs for the apparel industry. All these items constitute on average nearly 80% of the Indian imports to Sri Lanka and they are imported outside the FTA. This means these items are subject to normal customs duty and do not benefit from any tariff concessions. Hence, they enter the Sri Lankan market because they constitute the most competitive sourcing and provide value for money to local consumers. Importing these items more expensively from other countries would make Sri Lanka’s overall trade deficit larger and consumers would be confronted with higher prices. Contrary to this position, nearly 70% of Sri Lanka’s exports go to India via the FTA. Thus they benefit from the zero tariff granted by India. Clearly, Sri Lanka has been using the FTA more than India (Table 1). In fact, if we plot the goods exchanged between the two countries via the preferential tariffs offered by the FTA, there is hardly any deficit between the two countries. In fact, Sri Lanka has enjoyed a surplus on trade conducted under the bi-lateral FTA with India in six of the sixteen years since the Agreement came into force. On the basis of the above data, one can convincingly argue that the trade balance between the two countries would have been morein favour of India if the FTA was not in existence. These facts demonstrate that it is misleading and incorrect to claim that India has benefited much more from the FTA merely by citing the size of the overall bi-lateral trade deficit. If we look at the import : export ratio between the two countries, we can clearly see that the ratio has declined from 10:3:1 in 2000 to 6:6:1 by 2015 (reached a peak favourable ratio of 3.2:1 in 2005). This indicates that the Sri Lankan exports to India have grown faster than Indian exports to Sri Lanka (Table 2). While India has been the largest source of imports to Sri Lanka (even before the FTA) for many years, India has acquired the position of being the 3rd largest destination for Sri Lankan exports – a rank achieved with the benefit of the tariff preferences of the FTA. In that sense, India is the most balanced trading partner for Sri Lanka -- ranking high in both imports and exports of Sri Lanka. If one looks at the Sri Lankan export basket to India, which was dominated by agricultural products such as Cloves, pepper, Arecanuts, Dried Fruits, Nutmeg, etc., it has now become more diversified. It includes boats/ships, wires and cables, glass and glassware, apparel, woven fabric, etc., In 2013, the largest Sri Lankan export to India was boats and ships. Critics of the India-Sri Lanka FTA often say that Sri Lanka does not export items to India similar to those which it exports to EU and US (apparel, leather products, etc.). The point to note here is that export baskets vary from country to country and what eventually matters is the overall exports. There was a time when copper was the largest export to India (2003), likewise Vanaspathi (2005) and arecanuts (2014). These fluctuations do occur in FTAs especially when shrewd entrepreneurs exploit loopholes in the Agreement. 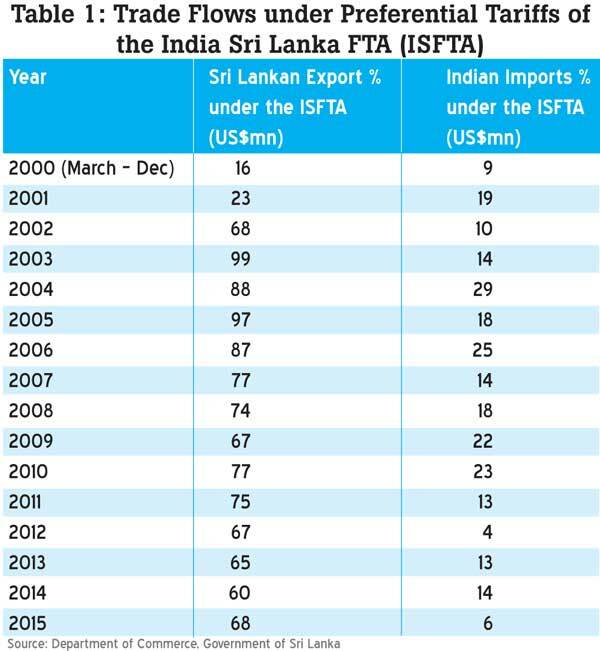 Available data shows that while Sri Lanka exported 505 product items to India before the FTA in 1999, the product items exported increased to 1062 by 2005 and 2100 product items by 2012 after the Agreement. This quadrupling of the product items from 1999 to 2012 provides further evidence for Sri Lanka diversifying its export basket to India after the FTA came into operation in 2000. The point to note here is that Sri Lanka should not lament about the trade deficit or the export basket but move forward with the rest of the world to gain maximum benefits from FTAs. The India-Sri Lanka FTA has certainly worked in favour of Sri Lanka but more work needs to be done to broaden and deepen it to reap the maximum benefits from it for Sri Lanka. One of the key areas currently beingaddressed are non-tariff barriers in the Indian market. Non-tariff measures are not barriers to all Sri Lankan exports, but for some of them like Marble, Maggie boards, perishable food items, etc. These barriers have been clearly identified through stakeholder consultation by the Department of Commerce. Trade Facilitation shortcomings were identified by an extensive survey by the Institute of Policy Studies of Sri Lanka. All such findings have now been submitted to the Indian Commerce Department for early resolution. The Government of Sri Lanka is attaching high priority to resolving these issues expeditiously. What needs to be noted is that even with some non-tariff barriers in the Indian market, if Sri Lankan exports have made a mark in that market. Based on this, one can argue that a deeper economic engagement with India can generate even more positive and beneficial outcomes provided the negotiations ensure that Sri Lanka’s interests are pursued vigorously. That is precisely what is attempted by the proposed Economic and Technology Cooperation Agreement (ETCA). It will lay the foundation for Sri Lankan exports and investments to benefit more from the rapidly growing Indian market. It is pertinent to point out that countries like Malaysia, Singapore and Thailand export between US$ 5 and 8 billion worth of goods and services per year to India compared to our US$ 645 million in 2015. This highlights the potential for increasing our exports to India which by common consent is going to be one of the fastest growing large economies in the world.